You will love today’s conversation with Pamela Gold. Some history: Pamela grew up on her family’s apple farm in upstate New York, graduated from Yale University, and then entered the business world in NYC where she was the point person on an IPO at the age of 24. 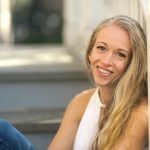 Leaving the workforce to start a family, she co-founded West Village Parents and went on to pursue her passion for fitness and wellness. It was through this pursuit that she discovered yoga, which connected her love of philosophy, science, psychology, and wellness and eventually led her to discover her life’s work: teaching inner peace as the key to our greatest evolution and ultimately, world peace. About a year and a half ago, she had a really big shift and wrote a book as a result of that shift — it took her three weeks to write and the rest is history. 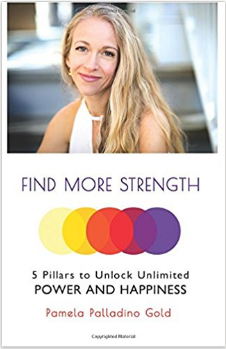 It’s called Find More Strength: 5 Pillars to Unlock Unlimited Power and Happiness and it is full of tragedy to triumph personal stories, along with actionable tools to help increase power and happiness in life. She jokes that all her friends read it and liked it and gave her those warm and fuzzy feelings we all love to feel from time to time. But the real mark of success for her is getting responses from strangers who tell her how much this book is changing their lives. Pam has since transformed not only her life, but the lives of others with her company Gold Evolution. Get to know more about Pamela Gold and her business, Gold Evolution on her website!